Boyds Resin Life Times Collection - Introduced for Spring 2008; The Greatness Within...You have inspired me. In ways, I'm sure, you will never know. As a young child, you saw something in me. 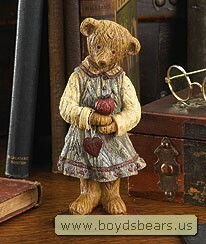 A "spar..
Boyds Resin Life Times Collection - Introduced for Spring 2008; The Greatness Within...You have inspired me. In ways, I'm sure, you will never know. As a young child, you saw something in me. A "spark" as you called it, telling me the future was limitless and my potential great. By working hard and following my dreams, this greatness would find me. At the time, I didn't understand but because you were so passionate in your convictions, your words have always been in my mind and in my heart. You were right...I worked hard, I followed my dreams and greatness has found me, expectedly waiting for its arrival. Some may call you a teacher, but to me you are so much more. You are someone who accepts the challenge to shape the future and inspire young minds and helps us to realize the greatness within. This resin piece measures 6" in height and will be delivered in a gift box.